Last night I had the privilege of watching Indian Ink Theatre’s ‘Krishnan’s Dairy’ at Q Theatre, Auckland. It was only two weeks ago that I saw the company’s production ‘Guru of Chai‘ and now this superb play, which is in its 15th year, is the one that started it all. 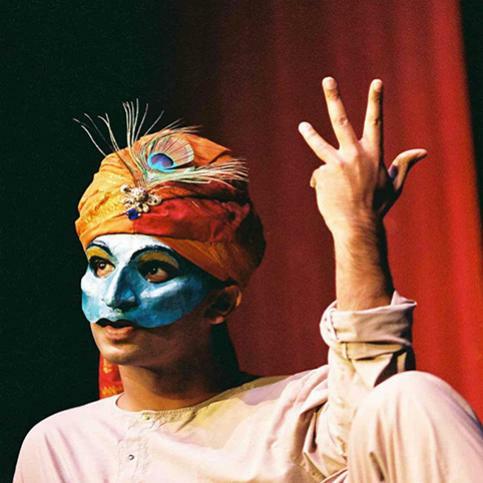 Jacob Rajan, as in Guru of Chai, plays all the parts on stage accompanied only by the hypnotic sounds of David Ward. The company’s uber talented musician and composer remains off stage for most of the production, only occasionally appearing though a lit curtain skilfully playing guitar. Krishnan’s Dairy tells the tale of an immigrant Indian couple, Gobi and Zina Krishan, who have moved to New Zealand to build a new life through running their own dairy (corner shop). It is a love story which allows us to reflect on our hopes and dreams, and tugs rather than pulls at our heart strings. The story of Gobi and Zina is cleverly paralleled with another great love story which I won’t reveal here. This unexpectedly touching yet hilarious tale is told solely by Jacob Rajan by the use of hand crafted marsks. He so swiftly changes marks within a blink of an eye that he is able to seamlessly transform from one character to the next. The set is kept to a bare minimum, as are the props, choosing instead the use of mime and sound effects often to fabulous comedy effect. Again Jacob performs these so accurately that one is transported right in to Krishnan’s Dairy along with it’s temperamental cash register. I can honestly say that I have never seen a solo performer as good as Jacob. His flawless and stunningly beautiful portrayals of both men and women really do trick the mind in to thinking there are other actors on stage. It’s a great complement to the writing too that this simple set and lone actor can produce the emotional reactions from the audience that I saw last night. This show is already looking like a sell out so if you have never seen this modern New Zealand classic now is your chance. The play runs until the 4 August. For tickets click here.